If you read my blog regularly, you’ll know we are big Lego fans. 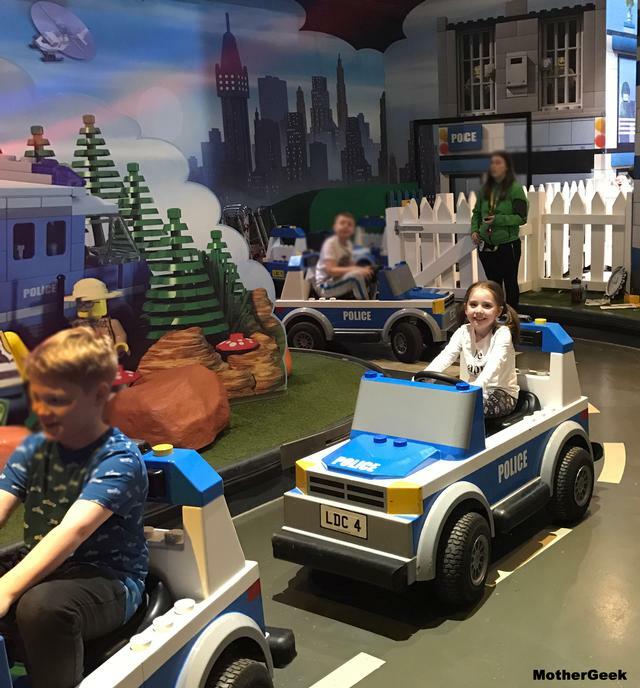 We live near to the Trafford Centre, and frequently visit Legoland Discovery Centre Manchester. When we were asked to pop along to check out the new facilities, we jumped at the chance. When we arrived, Syd was super excited to see that Professor Brick’s factory tour was still there. Once she had helped to get Prof. Brick’s Lego machinery working again, we entered the discovery centre and set to work exploring the new attractions. 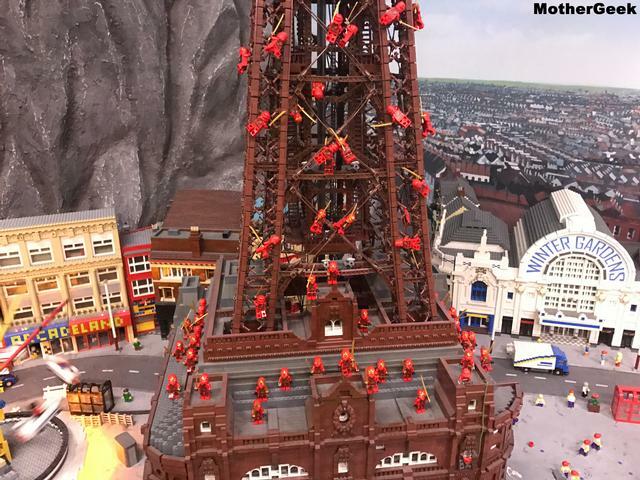 The Ninjago warriors were busy climbing Blackpool Tower in Miniland – I wonder if they had Fish and Chips for tea! Once inside the main area, the first thing Syd spotted was the new Ninjago City Adventure play area. This is a huge soft play zone, which is themed as a Temple! The idea is that children practice their Ninjago moves in the training camp before entering the three-tiered temple. 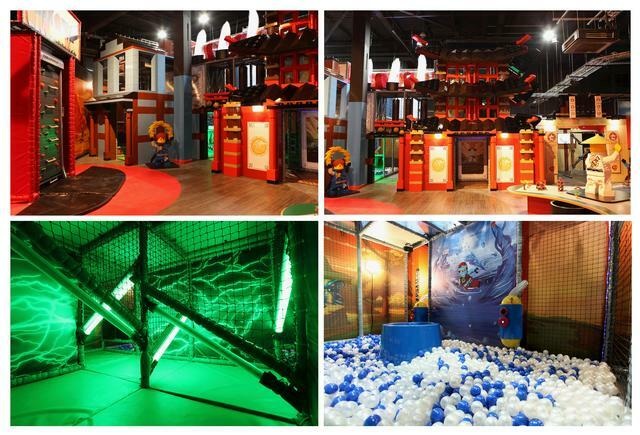 In the training camp, there is a Ninjago Build Table, Ninja Skill training and the rotating climbing wall. The idea is that once you’ve completed all 3 activities, you can head off into the Interactive Adventure playground. The Skill Training Zone is an interactive wall with various light up spots. (Just visible in the top right photo above). You had to touch the spot as soon as it lit up, and try to beat the other person playing at the same time. It looked like great fun for older kids, but Syd was too small to reach the higher spots, so we gave that a miss. 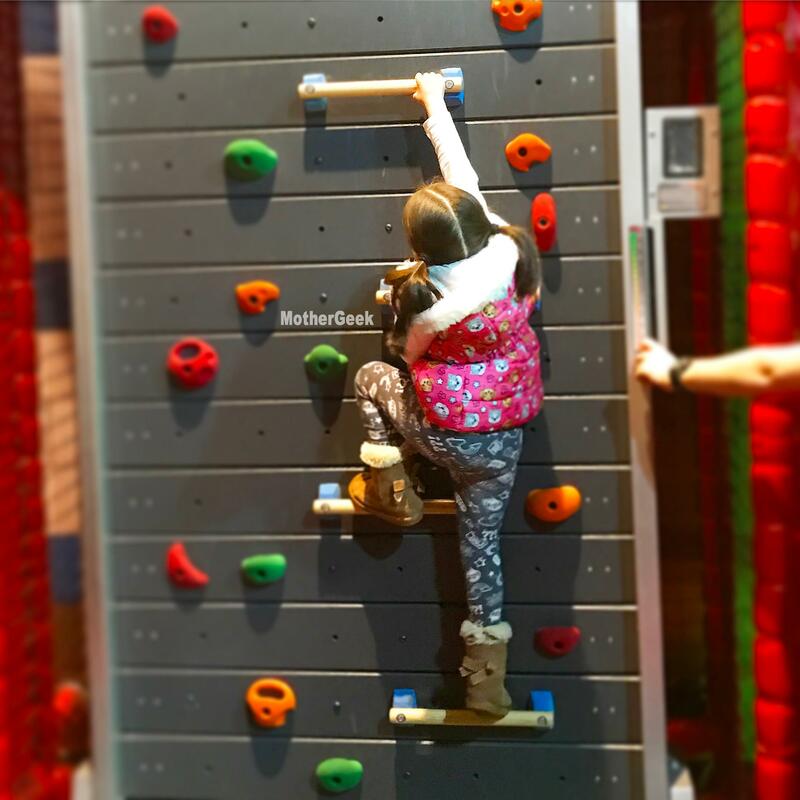 The new rotating Climbing Wall was the first new attraction Sydney took on. The wall slowly rolls downwards as you climb upwards, which makes it a never ending climbing wall! Once she had been accepted into the Ninjago ranks, Syd received a certificate and then headed off into the Three Tiered Temple. This is a huge soft play zone with lots of interactive features. It was far too busy for me to venture in there with the camera, but Syd tells me that, “The slide was totally dark, there were pretend fire torches, climbing walls and loads more cool stuff”. There was no shoe storage, so I had to carry Syd’s shoes around with me when she was off playing. There were several benches outside the Temple for grown ups to sit on and wait – I made this more enjoyable by indulging in a latte from the coffee shop. The new Coffee Shop has moved into the space where the old food area and party rooms were. It has super cool Lego brickwork and loads of seating. The best thing about the Coffee Shop is the Costa Coffee! It definitely makes sitting around while the kids play in the Temple enjoyable for the grown ups too! The day we visited was very busy, and they had run out of ham sandwiches, fruit and chocolate snacks. 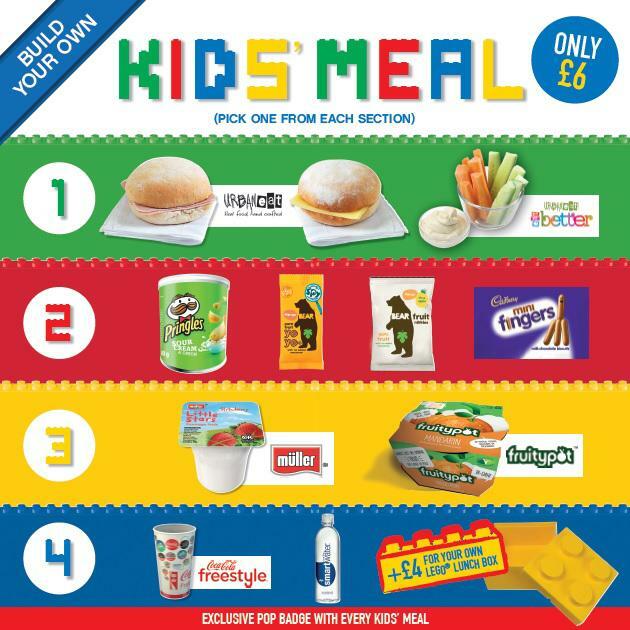 The kids meal deal includes unlimited refills of fizzy drinks or a bottle of water. Syd won’t drink water and I won’t let her have fizzy drinks, so I asked if we could have a carton of smoothie instead. I was told that was not part of the meal deal, so I ended up having to buy her one on top of the £10 for a cheese slice roll, bottle of water, tub of crisps and yogurt in a lego shaped lunch box. I’ll definitely take a packed lunch next time we go, but at least the coffee was good! Prior to the refurb, there was a Lego Friends zone at the back of the attraction but it wasn’t used much. This has now gone, and the space is split between additional seating and part of the new Party room. The Forest Ranger Pursuit car ride has shrunk a little to make way for the new party room too, but that didn’t stop Syd from enjoying it! I was happy to see the 4D Cinema was still there, and we loved watching the new 4D Lego Movie. We sat on the front row and really enjoyed it – Syd thought it was hilarious when we got wet! Lots of the old favourites are still on site too – Kingdom Quest, Merlin’s Apprentice rides are both the same. You will still find the Duplo Farm, Creative Workshop, City Builder and Lego Racers too. 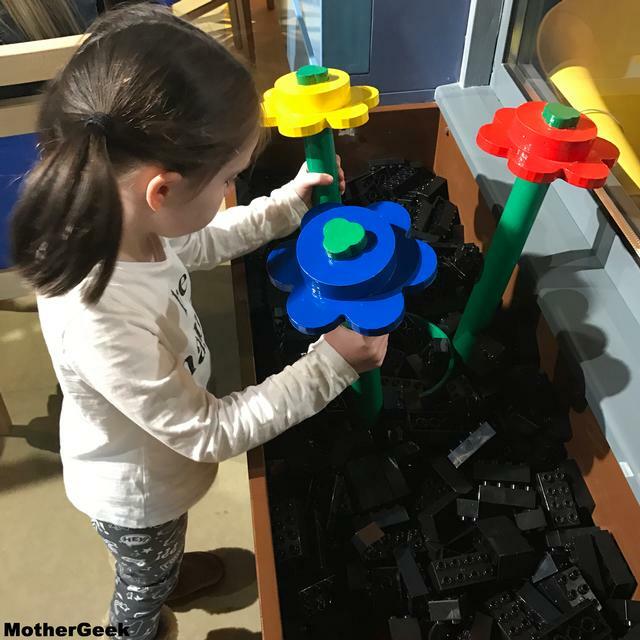 A lot of thought has gone into the new decor too – Syd was really excited by the window boxes outside the new coffee shop – she was a little sad that she could’t pick one of the Duplo flowers though! All told, we had a great time at Legoland Discovery Centre Manchester. Aside from the new children’s menu, I’d say the changes have all been for the better. 1). Book your tickets online – this will save you time and money! (Plus, if it’s super busy and you don’t pre book, you may get turned away). You can book your tickets here. 2). Take a packed lunch. 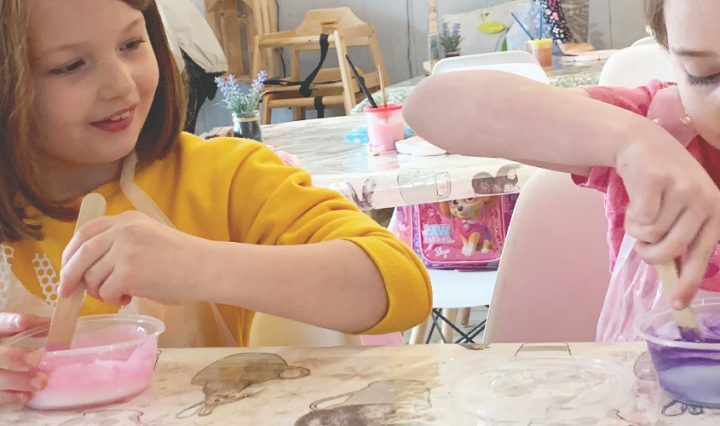 The new coffee shop prices are high – especially for kids meals if your child – like mine will insist on needing the lunch box! 3). Make sure your children wear shoes which are easy to get on and off. They need shoes off in the 2 soft play areas, but shoes on for the rides. It got tiresome tying Syd’s shoe laces every ten minutes. Lastly, why not check out more of my family content here. One final thing… To find out about the brand new Legoland Discovery Centre Birmingham, check out The Willow Tree’s blog post! We received complimentary entry to Legoland Discovery Centre Manchester for the purpose of this review.